Villa Sofia is a big country house surrounded by a beautiful garden. It is totally refurbished and well-finished in every details. All rooms are big and very bright; we are sure you will feel at home here! It accommodates up to 7 people in 3 bedrooms. It has two furnished bathrooms, a comfortable kitchen that opens to a wide veranda equipped with table, chairs, BBQ, so that you can spend very relaxing moments here, just having a rest or having pleasant open-air lunches. Villa Sofia is located in a quiet part of Ribera, just 3 minutes driving from the centre of the village where you will find bars, restaurants, shops and so on. It is a good choice for those who want to relax but also admire the beauty of nearby sea paradises and the sublime of historical masterpiece, such as the Valley of the Temples! Very good value for money and good location for visits. Grazie ai proprietari per l'ospitalità e l'accoglienza ! La casa è veramente confortevole, grande e con un bellissimo spazio esterno che abbiamo sfruttato tantissimo. La consiglio sicuramente ma occorre una macchina x raggiungere il mare e la bellissima spiaggia di Eraclea Minoa. 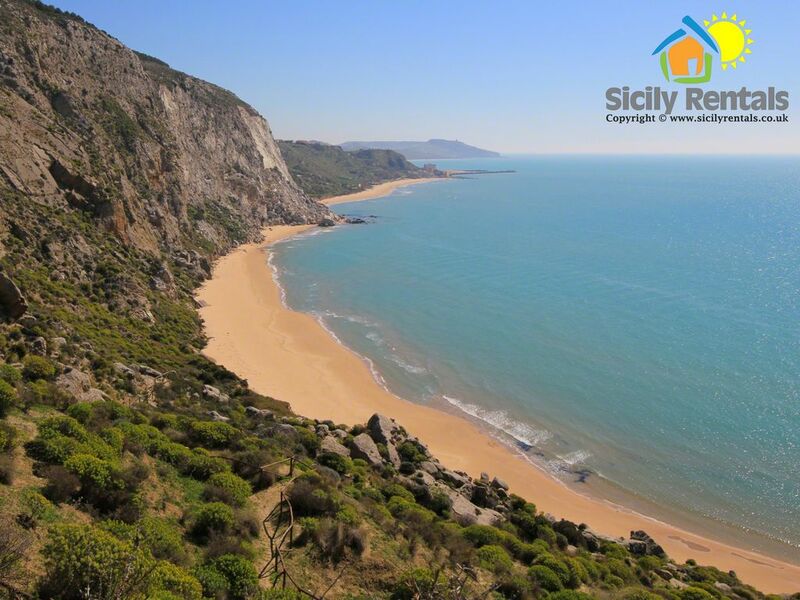 We chose this property for its proximity to the Verdura Golf resort, and to the holiday facilities and attractions between Sciacca and Agrigento. We stayed there for 7 days in July 2015 with our three kids (15, 14 and 6). The apartment could easily sleep another family of 4 to 5 if you are looking for an even better financial deal (check with the owners though). There is another apartment on the floor above, which was not rented at that time, but with its own entrance and separated terrace. The pictures are a true representation of the flat. It is recently renovated, clean, well equipped and above all, the owners and children are further along the estate, providing you with a very warm and helpful Sicilian hospitality. You can rent the linen ready and set upon arrival and pay an extra €60 for cleaning, well worth it. There are various supermarket options in Ribera 5mn by car from the house, but go try the independent vegetable shop, fishmonger, butcher etc... it’s part of the experience, at a price unheard of in the UK. We were to call the owner upon arrival in the centre of Ribera, and owner Toni and son Vincenzo arrived promptly after 5 minutes to show us the way to the house. Toni understands English and Vincenzo speaks English very well. He is also a mighty musician who is going to be attending the London School of Music in October. We were very pleasantly surprised with the apartment, with well appointed rooms and very clean bathrooms all in good working order. There is an Air Conditioning unit in the master bedroom, and despite the scorching temperatures, with the shutters closed and the AC on 23 degrees it was enough to keep a cool house when we returned in the evening. The wifi is provided complimentary and provides enough basic broadband for your surfing needs. It was rapidly fixed by Vincenzo when it once went down. The outside terrace is where we spent the majority of the time when in the house. It is very quiet with the exception of a little traffic noise in the morning (no heard inside the house). The stone built wood based BBQ/ pizza oven works very well..I used it 5 times, not for pizza though. Coal was kindly provided. Rustig gelegen woning; van alle gemakken voorzien; dichtbij Ribera; supermarkt en bakker dichtbij; auto noodzakelijk. Altijd volop schaduwmogelijkheden. Vriendelijke eigenaar. Die Kommunikation vor Anreise auf Englisch war problemlos und wir trafen uns mit dem Besitzer Toni in Ribera an der ENI Tankstelle, von wo wir zusammen dann mit unseren Autos zur Ferienwohnung führen, die etwas außerhalb der Ortschaft liegt. Ohne eigenes Auto ist dieses Appartement aber definitiv nicht zu erreichen. Alles war sauber, unsere Betten bezogen, frische Erdbeeren und Olivenöl zur Begrüßung in der Küche. Wir durften sogar nach vorheriger Anfrage gegen 10:00h statt wie im Vertrag festgelegt um 16:00h einchecken. Toni wohnt im eigenen Haus 40m weiter. Einmal wussten wir nicht, wie der Boiler anging, er hat ihn dann 10min nach WhatsApp Benachrichtigung gefixt. In der Dusche muss man den Hebel dann ganz nach links drehen und das Wasser mal 5 min laufen lassen. Die Küche ist sehr gut zum Kochen ausgestattet, lediglich ein gutes Schneidebrett könnte man noch hinzufügen. Auf dem Grill haben wir mehrfach Steaks und Fisch gegrillt... herrlich! Eine kleinen , aber gut sortierten Crai-Supermarkt gibt es 4min mit dem Auto entfernt die Straße runter. Insgesamt eine sehr schöne Woche auf Sizilien! Zentral gelegen .Gute Einkaufmöglichkeit,Netter Vermieter. Ribera rises on a wide hill not far from Agrigento. It is a big village, famous for its international oranges production, so that it is known as “City of oranges” all over Europe. “Scala dei Turchi” is a singular white cliff made by limestone and clay which rises along the coast of Realmonte and overlooks a crystalline sea. It has became a tourist attraction for its particular colour and shape; wind and rain have modelled it throughout the time, creating a huge natural staircase whose lines are rounded and irregular. Its white rocks look brighter thanks to the sun light and the water is incredibly clear.. it’s a paradise! The name comes from the Turkish invasions. According to an old legend, the Saracens got there from the sea and climbed the cliff until the top, once there they attacked the local people. Sciacca rises on a famous archaeological place between Selinunte and Agrigento; it is the oldest baths resort of Sicily and one of the biggest town in the south-eastern coast. It is a tourist destination not only for its gorgeous coasts, but also for its Baths and its famous Carnival. The spa resorts of Sciacca have been famous since antiquity. All its people know the legend telling that Daedalus, expert in labyrinths, was able to channel the hot vapors coming from the fissures of the rock and use them for baths. Very famous are the natural steam caves of St. Calogero, its healthiness attracts not only baths followers but also people who suffer from osteoarthritis and respiratory disease. One of the most beautiful and oldest carnival in Sicily and Italy takes places in Sciacca; there are six days of celebration with featuring impressive allegorical parades. The atmosphere is full of colour, pure fun and cheerfulness, everyone takes part in celebrations. In order to book the house the payment of 25% is requested as reservation deposit by bank transfer or credit card. The balance, together with the security deposit, will due cash the day of the arrival. Please note that the weekly price includes the final cleaning fee, that has to be paid once per booking (not weekly). Per prenotare la casa è richiesto il versamento del 25% della tariffa di affitto tramite bonifico bancario o carta di credito. Il saldo, insieme al deposito cauzionale, sarà versato il giorno dell'arrivo. N.B. I prezzi settimanali mostrati nel sito includono le spese di pulizie finali, tariffa unica per la durata del soggiorno e non settimanale.